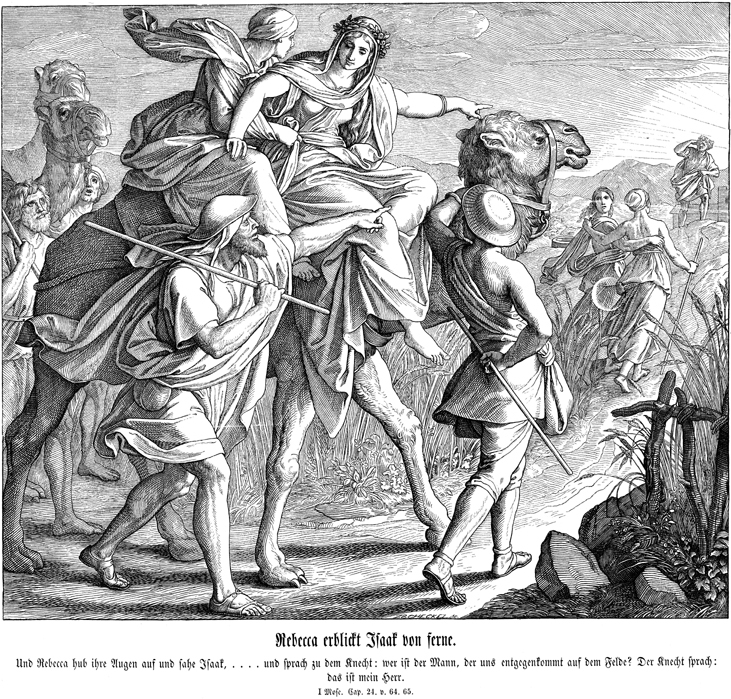 Rebecca meeting Isaac; Julius Schnorr von CAROLSFELD; 1898; woodcut from “Bibel in Bildern”. What an original meeting for two engaged people, the maiden Rebecca jumps off her camel when she makes out her fiancé! They are Rebecca and Isaac discovering each other. Actually Isaac, the son of Abraham and Sarah, the son of the Promise, has left to his father the task of choosing his wife. 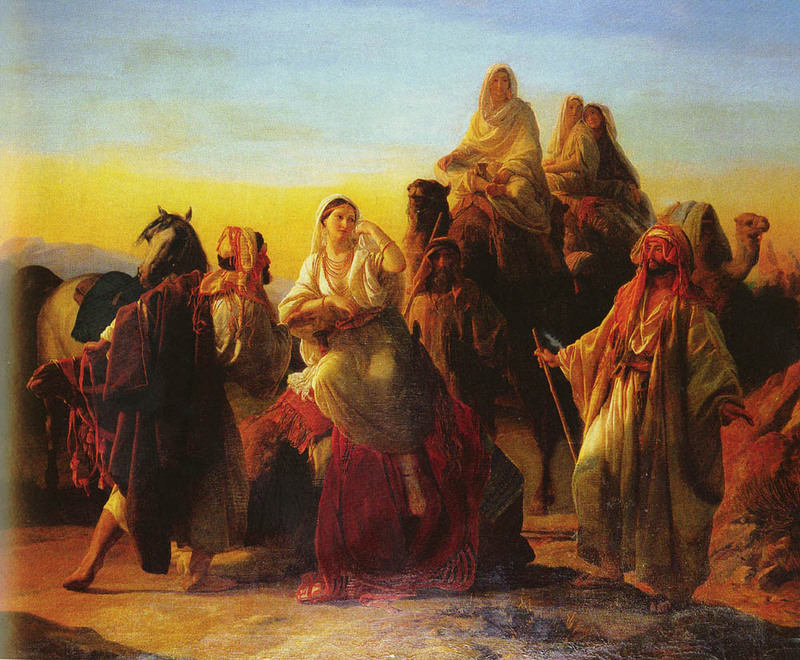 Abraham sends to his tribe a servant who, under divine inspiration, selects Rebecca. They come back on their camels and it is this scene of their return and so, of the first meeting of the future married couple, that is represented. 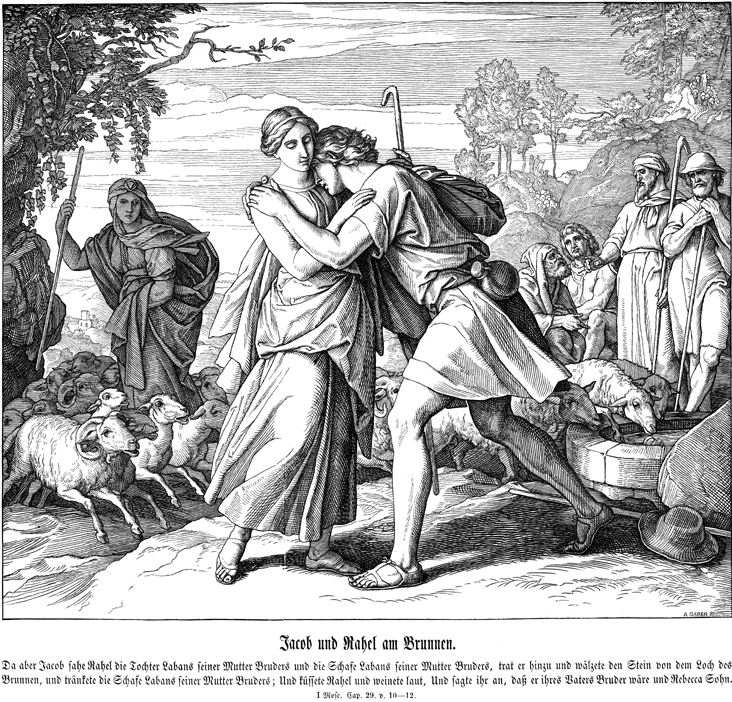 Jacob and Rachel; Julius Schnorr von CAROLSFELD; c. 1885; woodcut from “Bibel in Bildern”. Jacob meets Rachel keeping her flock. Unlike Isaac and Rebecca, no oriental aspect is to be found. 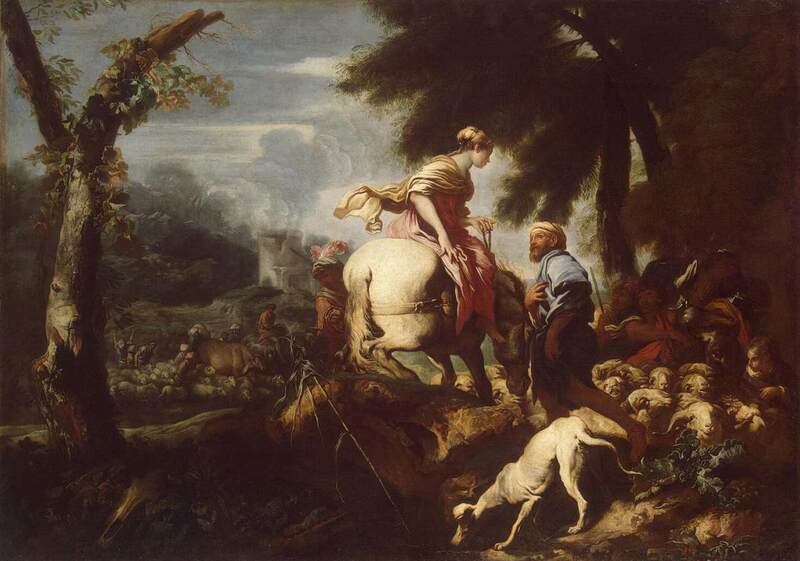 Rebecca who is to marry Isaac arrives at the camp. And Isaac went out to meditate in the field in the evening: and he lifted up his eyes, and saw, and, behold, the camels were coming. And Rebekah lifted up her eyes, and when she saw Isaac, she lighted off the camel. For she had said to the servant : "Who is this man that walks in the field to meet us? " And the servant had said: "It is my master" ; therefore she took a vail, and covered herself. Rebecca’s arrival is an opportunity for the evocation of the charms of the Orient and its nomads. Classical painting finding the camel not very noble, it was sometimes replaced by a horse. But the concern for local colour will make it reappear later on.